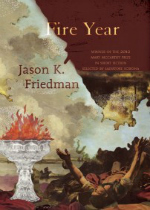 In Fire Year (Sarabande Books), the 2012 winner of the Mary McCarthy Prize in Short Fiction, Jason Friedman mines two very distinct veins of American fiction: that of the American Jewish experience, and that of the American South, particularly Georgia. And though those might seem incompatible, Friedman blends them in engaging ways. Without a doubt, the Jewish element of his stories stands out more prominently. In the opening story, “Blue,” a young man at his bar mitzvah contends with both his growing awareness of his sexuality as well as his communion with the Jewish community at large. The titular cantor in “The Cantor’s Miracles” grapples with issues of faith, charity and proper renumeration. Friedman also takes on two historical situations. 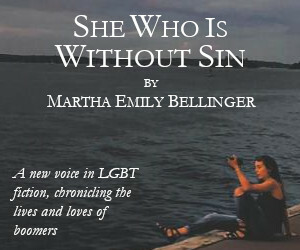 “All the World’s a Field,” for instance, follows the migration of one end of Savannah to the other in the early 20th century, causing friction between a traditional mother and her more ‘modern’ son, while the title story has a mythic, back-to-the-shtetl feel reminiscent of Isaac Bashevis Singer. Indeed, at times, it feels as if Friedman’s generosity to his characters extends a little too far. At times, Friedman lingers too long on ancillary characters, and despite the vivid and apt descriptions, the stories can feel saggy as well. I was more struck, however, by how the setting seems to have only a slight impact on the narratives. Obviously, Jews-in-the-South stories aren’t required to be sociological examinations of intolerance and discrimination, but by the same token, “The Golem” could have taken place in almost any setting, if it weren’t for a brief mention of plantations. The Georgian setting, for the most part, exists more for its scenic qualities (“Endless pineforest and marsh surrounded Savannah on three sides, the ocean on the other…”), rather than for any possible political ramifications. But when Friedman melds the picturesque and the political, as in “There’s Hope for All of Us,” his work shines brighter. In that story, the longest and richest in the collection, the boyfriend of an assistant curator makes a startling discovery about a Renaissance painter, which sends reverberations not only throughout Atlanta, but into the larger art world as well. 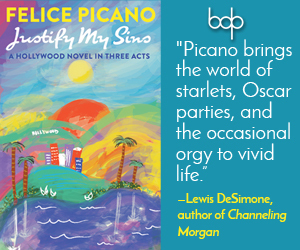 The ways in which homosexuality, art, commerce and race intersect in this story adds a lush texture to the narrative and suggest the ways in which art—and, by extension, fiction—can and should change one’s perception of the world.